Celebrate this fabulous achievement on and off the court as we take Hoffy Premium Beef Franks and crispy Hoffy Bacon to new heights. It’s a slam dunk of great flavors! Lay the strips of Hoffy Bacon in a single layer on a baking sheet. Bake until crispy, then drain the bacon on paper towels. Place the hot dogs in a sauté pan and place them in the preheated oven. Roast for 10 minutes, turning once. At the same time, bake the onion rings in the oven according to the package directions. To assemble the dogs, place two roasted Hoffy Hot Dogs on each Brat bun. Place a strip of crispy Hoffy Bacon on each side of the hot dogs. 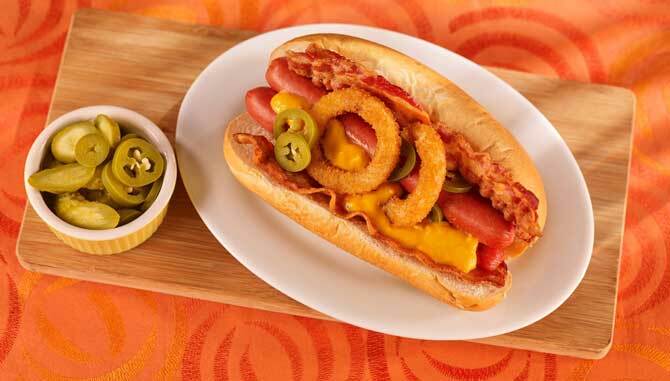 Spoon warm nacho cheese over the hot dogs and top with pickled jalapenos. Finish each Triple Double Dog with 3 onion rings.